Session B – Dance Ed. Camp – This is an opportunity for educators to share questions, thoughts and knowledge with one another. Participants suggest topics for discussion amongst peers, for example – dealing with injuries, assessment, appropriateness of dance costuming/choreography, etc. Participants are free to move from table to table in order to engage with the topics most concerning to them. Upon registration, participants will be asked to send in what topics they wish to discuss. Luca will offer a keynote on inclusion and dance, community building and his main motto, no excuses, no limits. His afternoon session will be a breakdance workshop for teachers and how to approach this for all levels of inclusion in the dance room. Luca “Lazylegz” Patuelli has lived by this motto his whole life. Born with Arthrogryposis, a neuromuscular disorder affecting the bones and joints of the body, he has undergone a total of 16 surgeries since he was 7 months old to support his legs, hips, spine, and shoulders. Despite facing physical challenges, Luca learned at early age about the power of adapting positively to any situation. Always wanting to stay active and join his friends in any activity, he was able to devise creative adaptations to be able to participate in soccer, football, and baseball. He even succeeded in learning how to rock climb, surf, and ski. He found ways to be able to join his high school swim and dive teams. As he explored the full gamut of physical activities, skateboarding developed into a particular passion. Then, at 15 years old, Luca was introduced to breakdancing (Bboying/Bgirling). Immediately, he was attracted to the music, the culture and, of course, to the challenging movements. He slowly began creating a unique style that took advantage of his upper body strength. 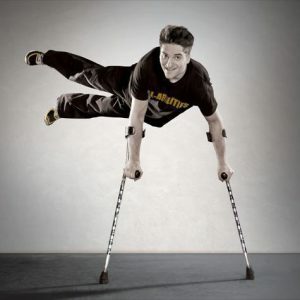 By using his crutches as extensions of his arms, Bboy Lazylegz was born! Over the past 13 years, Lazylegz has developed his career as a professional dancer by competing and performing in a wide variety of international dance events such as Breakin’ Convention, Freestyle Session, IBE, R16, Circle Prinz, World of Dance and Hip Hop International. With growing notoriety, he has had opportunities to appear on both Canadian and American media, including appearances on the Ellen Degeneres Show, So You Think You Can Dance Canada, The Today Show, America’s Got Talent, Tout le Monde en Parle, Star Académie, TF-1 and Paul O’Grady. A few years ago, just as his dancing reached a new peak in maturity and his message gained momentum, Lazylegz was given the honour of both headlining and being Segment Director for the 2010 Paralympic Opening Ceremonies. This world-wide coverage led to an invitation the following year from the Théâtre National de Chaillot in Paris, France to join the cast of Montalvo-Hervieu’s production of Orphée as a lead dancer. Overall, Laylegz has toured the world, performing and inspiring in over 22 countries. He remains an active presence on the international stage as the current National Youth Dance Ambassador for the Canadian Dance Assembly. With dancing clearly part of his identity, Luca “Lazylegz” Patuelli wanted to see how far he could truly grow. In 2009, he graduated from Montreal’s Concordia University with a Bachelor’s degree in Business and a Major in Marketing, Combining his passion for dance with his knowledge of engaging the masses, he has become a strong advocate for inclusion and integration as he aims to bring people of all abilities together through the power of dance. He created ILL-Abilities, an international Bboy crew comprised of some of the world’s best differently-abled dancers. Together, they have choreographed several theatrical dance productions acknowledged by the Society of London Theatre. As a result, ILL-Abilities received a nomination for Outstanding Achievement in Dance for the 2013 Olivier Awards. Whether through his own dancing, his choreography or his entrepreneurial character, Luca has become a leader for both dancers and people living with special needs. On top of his busy schedule, Lazylegz also co-founded RAD Movement, formally known as Projet RAD, an inclusive urban dance program for youth with disabilities. In 2015, David Johnston, Governor General of Canada, recognized Luca along with partners Melissa Emblin and Marie-Elaine Patenaude with a Meritorious Service Medal for their dedication and commitment in creating a more inclusive society for people with disabilities. Generating new movement isn’t as hard as you might think! Improvisation can help with a dancer’s confidence, spacial and body awareness, ability to identify movement patterns and phrases, and versatility in movement quality. In this workshop we will actively discover new ways of creating and initiating movement. We will explore movement possibilities through experimenting with kinaesthetic, image, and emotion lead exercises. Please wear comfortable clothing and prepared to move and discover! Claire Marshall has been an active member of the Winnipeg dance community for the past 20 years as performer and educator. After training in her hometown of Toronto with the Canadian Contemporary Dancer Theatre, she followed Ms.Rachel Browne’s advice and moved to Winnipeg to attend the Professional Program at The School of Contemporary Dancers. After completing the program, Ms.Marshall was already actively teaching at SCD and Canada’s Royal Winnipeg Ballet School, Professional Division. Ms. Marshall has performed works by numerous choreographers including, Rachel Browne, Stephanie Ballard, David Earle, Danny Grossman, and Bill Coleman. Ms.Marshall has performed several productions with Jolene Bailie’s Gearshifting performance works, including touring to Xian China in 2015, and has collaborated with the Young Lungs Dance Exchange and other independent artists. She also created a piece of choreography along with Marijka Stanowych for the opening celebration for the Canadian Museum of Human Rights. Ms.Marshall is currently the President of the Board of Directors for Dance Manitoba. Both were originated in northern parts of India/Pakistan and they are a mix of singing and dancing to the cultural/romantic songs and rhythms. Originally they were confined to weddings and rural folk festivals but presently they are well known all over the world. These dances have also been performed at hockey arenas before the games in North America. It’s a wonderful entertainment and exercise that enriches our souls. Diljeet Brar is the Director of Bulla Arts International Inc. which is a dance and personality development school in Winnipeg. His school is training over 200 students on various personality development tools like folk dance, language, culture and journalism etc. Diljeet has been participating in folk dance competitions since his university days as a student. He also trained university students on folk dance while serving as university professor in India. He has represented Punjab Agricultural University at national level and India at International level in various youth festivals. Apart from this Diljeet has also presented TV and Radio programs in India and Canada from time to time. Always wanted to try tap dance, but didn’t know where to start? In this class Robin Dow will take you through a basic tap warm-up, and then teach you an easy to follow, user-friendly tap combination. Whether you are a beginner tap dancer, or an experienced teacher who is looking to add tap to your existing program, this is the class for you! Tap shoes will be available for those who need them. Robin Dow began her career in the arts as a professional dancer, before discovering her love of teaching and choreography for performers of all ages. Over the past 35 years, she has choreographed, directed, and staged dances for countless productions, including the half-time show for the Grey Cup, the Winnipeg Fringe Festival, and Manitoba Theatre Centre. She also co-wrote, choreographed and performed in over 30 segments for Sesame Street. A much sought-after dance educator, Robin taught for Winnipeg 1 School Division, (where she was one of the founding teachers for the Grant Park Performing Arts Program), Seven Oaks School Division, and the University of Manitoba Faculty of Education. Currently Robin is an elementary dance specialist for Balmoral Hall School for Girls, and a teacher/choreographer for the Desautels Faculty of Music Musical Theatre Ensemble. Recently Robin was awarded the prestigious Theatre Educator Award for the 2017 Winnipeg Theatre Awards. She is proud to have taught many students who have gone on to successful careers in both theatre and dance education.